Photo courtesy of Bobby’s English Tack, from their NEW website! Love high quality, super soft leather? Hate high prices? (Duh!) Then Bobby’s English Tack is the manufacturer for you! As I’ve said before in previous product reviews (see my reviews on Kerrits GripTek Breeches and Mountain Horse Sovereign Field Boots) I am one of those people who tends to find something they like and stick with it until the product is either discontinued or the company goes out of business — God forbid! And yes, I eat the same thing at my favorite restaurant every time. I am totally one of those! Way back when I first started riding again as an adult, and I was on even more of a budget than I am now, a friend of mine recommended Bobby’s English Tack for a high quality bridle that I could afford. Said friend was NOT on a budget, so considering her options and wise choices, I decided to give them a try. To say that I was pleased would be a vast understatement. I ordered a black dressage bridle with a flash. It was beautiful! The leather was soft and pliable, and it fit my horse perfectly. Now, granted, I am a bit of a stickler (again vast understatement) when it comes to keeping my tack clean, but I still have that original bridle. It’s now almost 15 years old and still in good shape. I realize that is in part due to my tack cleaning regimen, but good leather is good leather. Bobby’s only sells good leather. According to their website, the family that owns and runs Bobby’s English Tack has been making high quality tack since 1880. At one point in their history, the company was even the official tack supplier for the British army. No small feat! This same quality is certainly evident today. Based in California since 1970, the one problem has been sometimes been finding a vendor who carried them. However, the search is over! Just this past week, Bobby’s English Tack launched a new streamlined website that is really beautiful and showcases their products well. The best part about it: the customer can now order directly from them! Any order over $50 (most bridles and halters) ships free, and with size charts and easy measuring instructions, why go anywhere else? There are currently four Bobby’s bridles (two dressage and two figure eight) and one Bobby’s halter hanging in my tack room right now, including the one that is almost 15 years old. I truly cannot say enough about them. They are soft, but now too soft, the fittings are beautiful, the bridles are beautiful, and they hold up to water and wear. 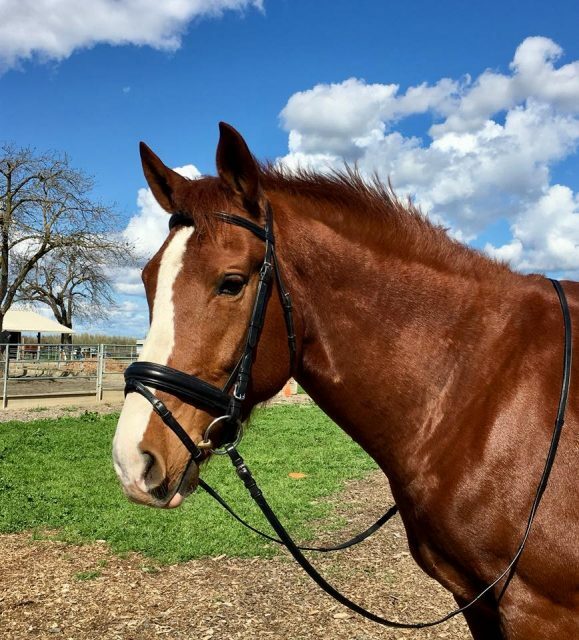 Bobby’s has bridles that start as low as $70 and average around $300. They sell reins, brow bands and girths as well. In addition, if you need a new part for your bridle, such as cheek pieces or a noseband, they will sell you one. The company is easy to deal with and appreciates its customers. Right now, because of their new website launch, Bobby’s is offering a free gift with the purchase of a bridle. Who doesn’t want a free gift?! So the next time you need a new bridle, halter or pair of reins, give Bobby’s English Tack a try. You won’t be sorry you did! Visit the website here. Go Eventing.